This is a fantastic opportunity to try your hand at one of the orients best kept secrets! Double Happiness Studio in the guise of Paul and Claire have between them been studying this endlessly fascinating art for almost forty years. 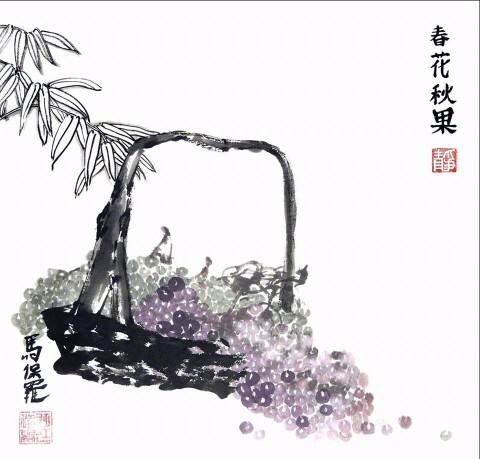 We have studied Chinese Calligraphy and Painting with Taiwanese, Chinese, European and UK artists and exhibited around the world, as well as locally. We have always been interested in oriental arts and culture and this passion developed into one for Chinese Brush painting for Paul when he found himself incredibly fortunate to be able to begin to study Chinese Calligraphy with Professor Su-Liang Tseng of one of Taiwan’s finest Universities of Art. We are always exploring different styles both traditional and contemporary. Vines lend themselves beautifully to both so you can explore delicate or bold strokes under expert tutelage. Paired with Brynne Vineyard wines as inspiration it's a treat not to be missed! Everyone can enjoy this relaxing and creative art - you don’t have to be an artist but perhaps this is the day you become one!